Out of thousands of parts that are working inside your car, there are some things which are critical for your car actually to move. The engine of your car produces all that power that is needed to make the car move, but your transmission is what makes use of the force the engine provides. The transmission of your car contains some parts which are critical for it to function correctly. A conventional transmission is made up of a lot of different parts, but the 4 major components are, the flywheel, the clutch plate, the pressure plate and the throwout bearing which we will talk about in a moment. Since the throwout bearing is used only when the clutch is depressed, you would know if your throwout bearing is bad or not when you depress the clutch. If the component goes bad, you would hear different types of noises. If the issue is left unresolved, your clutch pedal will eventually get stiff and you will find it difficult to shift gears as the throwout won’t be able to disengage the transmission from the engine properly. If a bad throwout bearing isn’t addressed quickly, it can lead to a failure of the complete clutch system. Without the clutch system, you won’t be able to shift gears. Throwout bearing, which is the focus of this article, is a part of the clutch system which allows the transmission to disengage from the engine. This is something that happens in manual vehicles only as the driver controls the shifting. In a manual transmission car, when a driver is ready to shift, he or she would depress the clutch and put the shifter into the appropriate position. This transition is done with the help of the throwout bearing which makes the process seamless and makes the shifting smooth without any jerks. It works by putting a linear thrust force that is exerted by the driver using the clutch pedal. 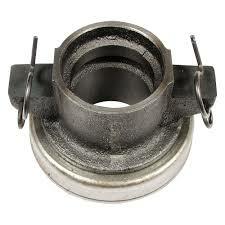 The pressing of the clutch pedal lifts the pressure plate off of the clutch by using a thrust bearing. That is attached to an inner race connected to the clutch throw out the shaft. The outer race is what helps with the disengaging. That is achieved by moving from the spinning clutch assembly to the non-spinning link. So in short, the throwout bearing works putting pressure on the outer spring which disengages the transmission from the engine so that the linkage is completely cut off while the shifting of the gear takes place. Considering this, we can say that the throwout bearing is critical for the disengagement part of the transmission. What does the flywheel do? To say it simply, the flywheel in the transmission is what stores the energy made by the engine. To be precise, it stores the rotational energy that is converted by the engine from the mechanical strength. The basic working principle of a flywheel is that it is resisting the changes of the rotating force output by the engine. The energy stored is dependent on how fast or slow the motor is rotating with the help of an aligning torque. The flywheel also smooths the variations in the energy and makes the movement uniform as the energy from the energy is not constant but somewhat intermittent. The flywheel can then output a combined power that is greater than that of the engine and what it can produce. The flywheel is nothing but a metal wheel which is rotating on a usual ball bearing. A pressure plate is something that sits at the other side of the flywheel with the clutch in between, helping to transfer the power from the rotational energy in the flywheel to the clutch, with the help of friction. The pressure plate is fitted on the flywheel. The pressure plate serves its purpose by exerting pressure against the clutch plate. Since the pressure plate is fitted onto the flywheel, when the clutch is released, the clutch plate is pressed against the pressure plate, making the clutch plate move with the help of friction as the pressure plate is moving with the flywheel. The pressure plate is made up of a metal plate, with coil springs on it. This allows the pressure plate to be pushed against the clutch plate evenly so that rotational force is wasted in the process as little as possible. The clutch plate is also called the friction lining, as the help of friction really moves it. This plate sits between the pressure plate and the flywheel. This plate is made up of a splined hub and the plate itself which is made up of metal. On the plate, there are friction linings on which the pressure plate applies the force. This allows the splines that are in the center, to engage with those splines which are there on the input shaft so that the input shaft can spin together with the disc although this ensures that the disc can slide nonetheless. How to get the throwout bearing fixed? The throwout bearing is something that is integrated into the clutch. Replacing it would require a professional mechanic to remove the clutch assembly and remove the throwout bearing out of the clutch assembly. 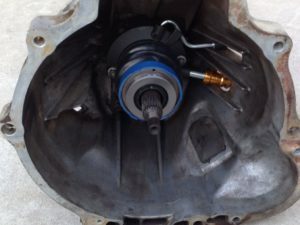 This can be pretty time consuming and costly as the throwout itself can sometimes cost as much as the whole meeting so in most cases when you have the entire clutch system out of your car, it is wiser to change the assembly rather than just the throwout. The replacement cost of the throwout bearing can often be very expensive since it’s located inside the belling house of the transmission. This means that you have to remove the transmission/gearbox from the car and this can be very time-consuming. Within the replacement of the bearing, you do often want to replace the clutch and in some cases, the flywheel also. This can result in a replacement cost of ~50-100$ for the bearing, 400-900$ for clutch and flywheel and you can expect a labor cost of somewhere between 300-1500$. Continuously Variable Transmissions (CVT): What is it? Will a Slightly Overfilled Transmission gets damaged?